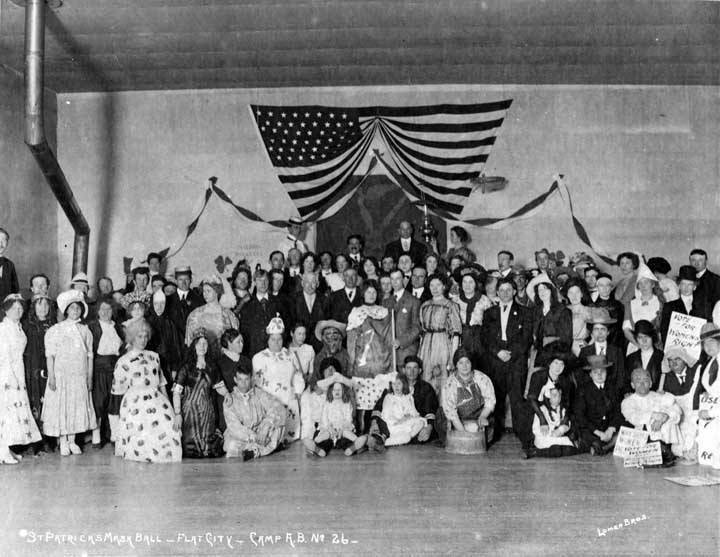 "Large group of people, some in costume, pose for photograph in front of bunting and American flag; signs held by people on far right advocate women's rights" St. Patrick's Mask Ball, Flat City, Camp A.B. no. 26. Perhaps one may, with ease, read the contextual aspects of the photograph above consigned as it is with the gendered, racial, and colonial contexts of early twentieth century United States representational politics. Four white men, government officials, signing in to law the right of women to vote in territorial Alaska in 1913.In the above image, Nome W.W. Shorthill's posture, his neck tilted a few degrees forward is mimicked with the framed image behind him. I am unsure who the images on the walls are representational of, but they too add to the dramatic aspect of the historic moment as they too look on as Governor Clark places his name on this document. Below is an image of the bill as it went through the state government. Beginning in the 19th century in the contiguous part of the nation women's suffrage movement(s) worked securing voting rights in specific states and localities. Within seven years of the law in Alaska, the United States government was pass ratify the 19th amendment, guaranteeing all American women the right to vote after a bill was passed by Congress June 4, 1919. Along with a women's suffrage movement in the Alaska Territory activists from the Alaska Native Brotherhood and Sisterhood worked tirelessly since their inception in 1912 for the enfranchisement of Native people. 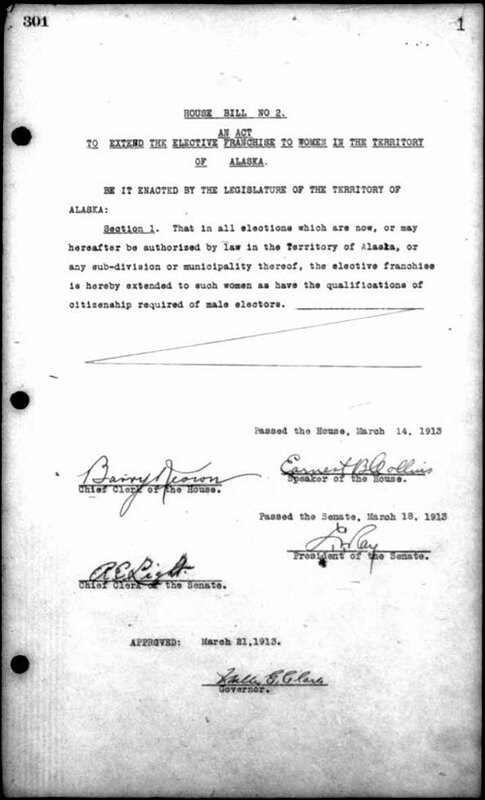 In an action by the Second Legislature of the Territory of Alaska in 1915 Alaska Natives could become electoral voters. They could take on the "obligation of suffrage if that showed a "total abandonment of any tribal customs or relationships, and the facts regarding the applicant's adoption of the habits of a civilized life." Then the Native applicant for citizenship would have to find at least "five white citizens of the United States" that could attest to the the applicant's degree of cultivated civility. 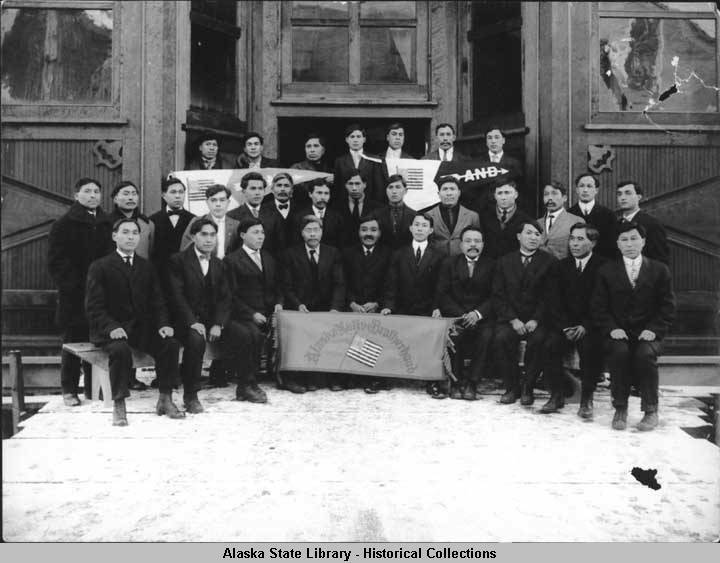 In 1923 Alaska Native Brotherhood member William Paul, of the Raven clan, was elected to the legislative house of the territorial Alaskan government. 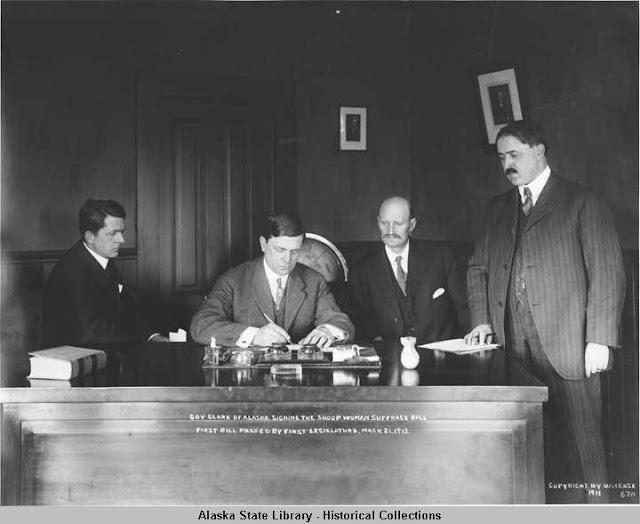 Within a decade the The Indian Citizenship Act of 1924 (43 U.S. Stats. At Large, Ch. 233, p. 253 (1924)), or the Snyder Act, made Native American citizenship in the United States compulsory, asserting "Be it enacted by the Senate and house of Representatives of the United States of America in Congress assembled, That all non citizen Indians born within the territorial limits of the United States be, and they are hereby, declared to be citizens of the United States: Provided That the granting of such citizenship shall not in any manner impair or otherwise affect the right of any Indian to tribal or other property." This act of citizenship followed the devastating consequences of 1887 Dawes Act, asserting citizenship upon tribal members in the contiguous part of the nation who participated in allotment. Similar to women's Suffrage, until the passage of Indian Citizenship Act states and territories acted unsystematically in declaring Native people as voting citizens.